I’ve pledged to walk the school run as much as possible. This means walking around 4 miles every day, five days a week. What I was looking for as I prepared for the start of the new school year was a fabulous pair of shoes that would keep my feet happy as I trudged to and from school twice daily. I was delighted to be offered the opportunity to review the new Memorise range from Hotter Shoes. Having tried a pair of stunning Hotter Shoes before, I knew my feet would be well cared for in a Hotter pair. I was spot on. I opted for the Astrid style in black. They arrived promptly in the post and were true to size. I have wide-ish feet. Although Memorise are advertised as standard fit, there was enough room for my Hobbit feet to sit comfortably in. Like the other styles in the Memorise range, the Astrid came with an innovative memory foam insole footbed. It is designed to remember every contour of your feet and mould to it, providing a comfortable fit. The memory foam is also naturally shock absorbing, offering enhanced impact absorption to your feet. I have been using my Hotter Shoes every day for just over a week now, and am genuinely pleased by how comfortable and light they feel. The left shoe felt a little snug to start with, but has since stretched a bit and relaxed. I love that although it says ‘black’ the Astrid comes with a deep pink sole and stitch detail for added style. The soles are sturdy and grip well. Most important, the shoes come with a pair of Velcro fasteners – perfect when you are in a rush in the morning and don’t have time to waste on fiddly shoe laces. I am really pleased with my new pair of Memorise by Hotter Shoes. They score on all fronts, from fit to style to comfort to price (£59 for the pair) and have made walking even more enjoyable. Better still, I can wear them with just about most things, be it leggings, jeggings, jeans or tights. 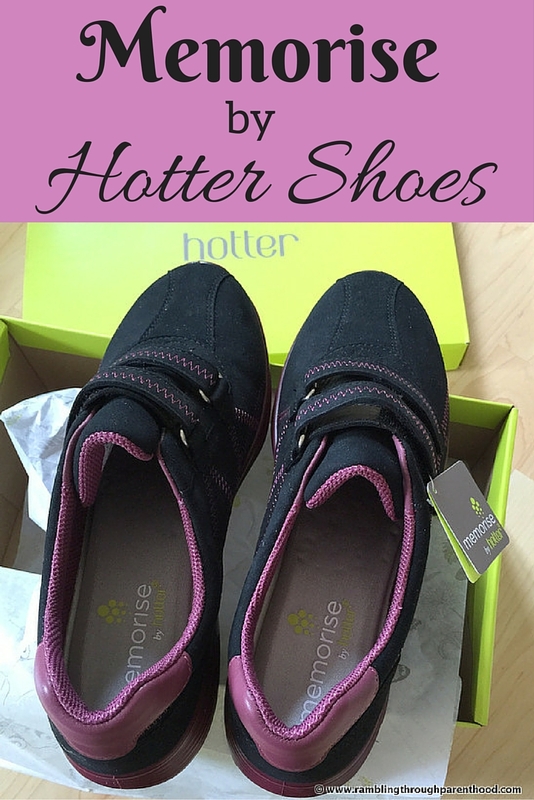 Disclosure: I won a pair of Astrid Shoes to review after entering a competition hosted by Hotter Shoes. All opinions are my own. I don't think I've ever tried a memory foam shoe, they look incredibly comfortable and versatile shoes. Even before I read the post I saw the picture and knew the shoes would be comfortable. Love the colours as well. The shoes looks fab, and clearly very comfortable. Thanks for sharing the love. These look perfect for walking I think I may have to have a look at them for work as I spend around 10 hours a day walking around a shop! That is great that they have created trainers that adapt to the contours of your feet and they do look super comfortable! These look really comfy and I love the design too. I do got for comfy over almost everything else! Ooh I've never actually owned a Hotter pair of shoes but I keep seeing good things about them everywhere! They look great for the school run. I'm fast becoming a fan of Hotter shoes! Love the look of these, they look really comfortable. we have a store in town, I must pop in. I love Hotter shoes, so comfy they are like walking on cushions! Perfect for the school run! We love to wear stylish, fashionable, affordable and comfortable shoes. We love footwear that can last without sacrificing style and quality. These attributes and more can all be found in Hotter shoes collection.I find this site for best walking shoes for wide feet. I was charmed to be offered the chance to audit the new Memorize range from Hotter Shoes. Having attempted a couple of shocking Hotter Shoes some time recently, I knew my feet would be all around administered to in a Hotter pair. I was right on the money.